If your goal is losing weight, really your goal is fat loss. When someone wants to drop weight, they need to lower their body fat and increase lean muscle mass in order to look better. 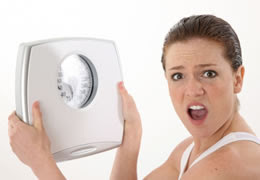 When the goal now becomes to lower body fat our scale no longer becomes useful. Instead what you should focus on is getting your body fat percentage taken at your local gym and use that as a baseline. I have seen way too many clients self-sabotage themselves by becoming a slave to the scale. Every week or even every day checking the scale to see their fate and it never helps! Checking the scale too often results in one of two scenarios. A) You realize you haven’t lost weight or lost what you expected to lose in which leads you to become frustrated and bail on your program. Not good! B) You realize you lost weight! Great, amazing, so awesome! However, you take the foot of the gas and coast a little and get too high and lose that edge. Not good! You really need to trust the program and nutrition plan you are on and focus on doing everything you can consistently to get to your goals. If you do this you will get the desired outcome when you finish the plan. Now I am not saying never check the scale at any point I just want people to avoid the constant ups and downs of checking your weight all the time. Sure, every month or so it is not a bad idea to check the scale AND your body fat percentage to see if progress is being made but just don’t become a slave to that thing!